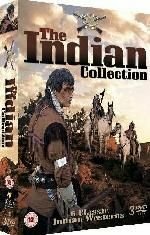 Collection of western films and feature-length TV episodes. In 'Cry Blood, Apache' (1970) five wandering prospectors discover gold at an Apache camp, and quickly despatch the resident Indians bar one woman (Marie Gahua), who they hope can lead them to more riches. A brave who was absent at the time of the killings returns to discover the massacre and quickly sets out to track the murderers down, meting out justice the Apache way. In 'Mohawk' (1956) Boston artist Jonathan Adams (Scott Brady) travels to Mohawk Valley to paint portraits of the Native Americans, and while there falls in love with the local Indian chief's daughter, Onida (Rita Gam). But when a resentful local landowner, Butler (John Hoyt), tries to instigate a war with the Indians, Adams is forced to step in to stop the bloodshed. In 'The Battle of Bloody Stones' (1967), an episode from the 'Cimarron Strip' TV series, John Wolf (Tom Nardini), the son of Indian Chief Ghost Wolf (Henry Wilcoxon), is killed as a result of a re-enactment show put on by Wildcat Gallagher (Gene Evans). It is up to Marshal Jim Crown (Stuart Whitman) to suppress the outbreak of war between the Indian tribe and Gallagher's posse. In 'Heller' (1968), another episode from 'Cimarron Strip', Marshal Crown is badly injured when chasing thief Logan Purcell (Morgan Woodward) and his fellow outlaws. When Heller (Tuesday Weld), a young woman with connections to Purcell's gang, helps Crown to recover, the two decide to run away to Cimarron but are chased by the crooks who are determined to punish Heller for her betrayal. In 'Sitting Bull' (1954), set in the lead-up to the Battle of Little Bighorn, Major Robert Parrish (Dale Robertson) is disgusted with the US Army's treatment of the Sioux Indians in the Black Hills of Dakota. Parrish attempts to make peace between the warring sides, but when he fails, a final brutal battle ensues. J. Carrol Naish co-stars in the title role. Finally, 'Kentucky Rifle' (1956) follows a group of travellers whose wagon breaks down in Comanche territory. Concealed in the travellers' wagon are Kentucky rifles, made for settlers to defend themselves against the natives. Aware these weapons are in the group's possession, the Comanche tribe deliver an ultimatum - if they do not hand over the rifles, they will not be allowed to pass safely through the Indians' land.